The Vita Mystique is a huge hot tub, if space is not an issue and you want a really big hot tub that seats 7 people in style, then the Mystique is a great choice. This is the very pinacle of the Vita range, a huge 10 feet in length complete with the legendary Vita Wave Lounger, two large corner seats and two couch seats, the Mystique is a brilliant hot tub if you want to relax in a very large tub. Every additional feature is included as you would expect in the very best model in the top of the range category. From a range of water features includingf fountains and a complete LED underwater lighting system, the Mystique really has it all. The size also means that this is a hot tubs with room for 7 people in style, no cramped conditions here as you can all relax and enoy the hydration from the 89 jets including a total of 20 champagen air jets. 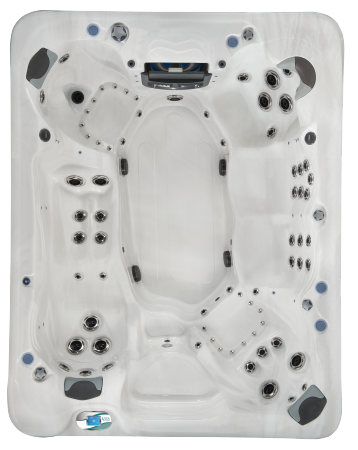 If you want the best hot tub out there and have plenty of room, the Mystique from Vita is the best choice. Available to buy from Bay Spas along with a great delivery, installation and set up service, Bay Spas will help you every step of the way, Covering the whole of the West Country including Devon and Cornwall, call Bay Spas now form more information on this top of the range luxury 7 seater.